No matter what you got up to this weekend very few of you will have been unable to miss the breaking news that Kenyan’s super talented Eluid Kipchoge SMASHED the world record in Sunday’s Berlin Marathon. Running an eye watering 2 hours 1 minute and 40 seconds, shaving more than a minute off Dennis Kimetto’s previous world best of 2:02:57 in the same race back in 2014. To put this in perspective that is the equivalent of running 100 metres in 17.2 seconds…. and then repeating it 420 times without stopping!? Fancy it? Well a massive congratulations not only to Eluid but to everyone that took part on Sunday, and a special mention for Teresa Reynolds Wood, David Lees, and Pamela and Paul Walker from my Performance Community. You have just completed one of the six marathon majors and in the exact same race that saw a new world record set over the prestigious 26.2 miles. Now a few days ago on my Facebook page I shared my race data from the 2015 Amsterdam Marathon, my best ever race. However, inspired by Sunday’s epic event I thought I’d share with you my data from the 2013 Berlin marathon. A vastly different affair. Leading up to the 2013 Berlin Marathon I picked up an injury which stopped me in my tracks completely. I didn’t run for four weeks leading up to the event. I can tell you that standing on a starting line with 40,000 other runners when you have done nothing for several weeks is a VERY strange feeling indeed. 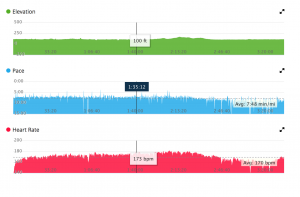 I wasn’t training on heart rate back then (although I always tracked it) and being injured in the weeks before the event meant I had to run virtually entirely on feel as I had limited knowledge on where my fitness actually was. Very tricky to say the least. You can see from the pace and heart rate that the race started well. My HR built steadily, and up until around 20 miles things were going well. Then… suddenly…. my legs reminded me that I hadn’t ran for four weeks and they very quickly turned into lead. Not only did I hit the wall, I took a bite out of every single brick in the process. After weeks and months of hard slog this was certainly not the taste of success I was hoping for. From that point onwards I remember willing myself to each water station and ‘allowing myself’ to walk a little bit once I’d made it. It was like a mini reward system I’d created to help me deal with the situation at hand and drag myself to that finish line. What I really want to point out here though is the heart rate in that brutal final 10K. You can see from the graph that the pace drops…. but so too does the heart rate. Now you might be thinking that if I was finding the race increasingly more difficult, which was forcing me to slow down, then why didn’t my heart rate increase to reflect the extra effort needed to drag my body along the asphalt?! Well in running your legs effectively DRIVE your heart rate, and once the legs have ‘gone’ it becomes increasingly difficult to generate the power required to elevate the heart rate. Think of it like your legs having to power the heart like a hamster’s legs power a wheel. Initially the wheel spins fast, but when the hamster begins to tire the wheel begins to slow down (unless of course said Hamster is from Kenya and spent most of it’s childhood days running 10 kilometres each way to Hamster School and back). Five water stops later and through sheer grit and determination I clambered across the line in a sweaty mess. Two of my friends came away with very well deserved PBs. I came away with a pair of battered legs, my slowest ever marathon time, and a hugely humbling experience. 1) Effort doesn’t always equate to an elevated heart rate. 2) Not every race goes to plan.